Wash. (May 25, 2018) Airman Macey Zuniga, from Mililani Town, Hawaii, raises the “12th Man” flag aboard the aircraft carrier USS John C. Stennis (CVN 74). 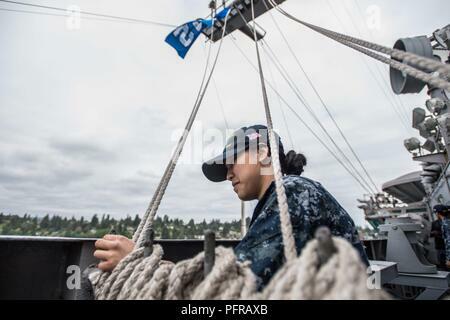 The Seattle Seahawks football team and Sea Gals cheerleaders held a military appreciation event aboard John C. Stennis to meet and visit with Sailors. John C. Stennis is pier-side after returning to homeport after the completion of a seven-week underway where the ship’s crew completed TSTA/FEP early and Carrier Strike Group 3 Group Sail in preparation for its next scheduled deployment.